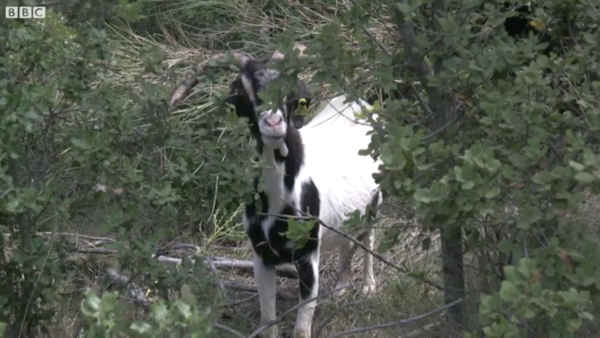 Screenshot from BBC's "Fighting fire with goats"
"They eat what is the fuel for fires," says Sergi Nuss, who runs the project, which is based in Girona, an area where there were recurrent wildfires in summer. By chowing down on grass and the leaves of young trees and bushes, the goats and sheep can help reduce the chance that a fire will spread through grasslands and treetops. An added bonus is that the project creates more work for shepherds, who are a disappearing breed. To further boost the career prospects of shepherds, the Fire Flocks group encourages local butchers to promote the sale of goat meat. It is worth noting that goats and sheep are a bit different in their consumption habits. Sheep are mainly grazers, with their head down in the grass, while goats are more adventurous and will climb trees to browse for supper. But in the BBC's inspiring video of their fire-fighting efforts, the livestock appear to have no problem getting along amid the greenery.